The primary origin of the symbol is probably from Mesopotamia, as evidenced by visualization of Goodea’s vessel from Lagas. This vessel, made up from green steatite, is dated from 2144-2124 BC and represents the snake-formed God Ningkisdiza, messenger of Goddess Ishtar. Its similarity with Asclepios’s emblem resulted in the adoption of Caduceus as a symbol of physicians and medical science in general. However, Hermes, without being himself God of medicine, superintend on human health and offered to people assistance against diseases. They say that he once saved Tanagra from a deadly epidemic. Science of semiotics’ is the science that deals with the study of signs (symbols): with their specificity, their production, their interpretation, etc. It has expanded its interest beyond the study of the linguistic sign, the word. It also studies each type of sign, such as religious symbols, military emblems, poetic language, etc. Making a comparison between the figurative symbol (like what we will mention, i.e., Caduceus) and the linguistic sign (the word), when both lose their meaning, we note the following: the linguistic sign (word) ceases to exist, it means nothing. It is not used in human contact. For example, the word "bentelia = sum for the discharge of military service of Christians" is not currently understood by modern Greeks. On the other hand, the visual symbol (Caduceus), may have lost its importance, however, continues its existence with the aesthetic function of its specific pattern (motif). 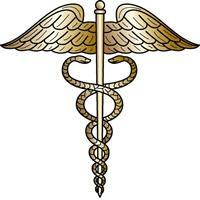 As we see in the above picture that is taken from a woven Aromanian pillow, the symbol of Caduceus exists. 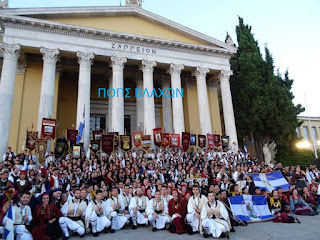 However, A. Bousboukis, (professor of linguistics at the University of Thessaloniki, in his book "Ethnoglossological Analects" Thessaloniki 2005, Publications ‘Erodios’) tells us that the popular (traditional) names give no indication of recognition of the particular symbol. The entire virtual cluster, in Metsovo, is called, in the Aromanian dialect, ‘ilenia kou coupa “= basin with the mug." Some weavers (women) call the stylized V-shaped wings: ‘ilenia’ = basin" and others "dislu di pite’ = half piece, because in the other side of the pillow, there is the other half of it and, if you join them, it takes the shape of rhombus. The cluster of snakes around the bar is called ‘koupa’ = glass, mug, cup, while another weaver with the word 'koupa' names the cup at the base of the cluster with the wings. The outline with the ducks, right and left of the Caduceus ,with the angular line that the work of the loom requires, has morphological approach to a saw and therefore it called by some weavers : saw or saws. In village Milia (near Metsovo) women call Caduceus ‘Eagle’, apparently from the multiple wings that frame the central theme (bar with the snakes). In village Samarina, a weaver named it ‘kavur’ = crab, probably from the facing snakes that give the feeling of the claws of a crab and Metsovo it is called ‘skinlu’ = thorn. 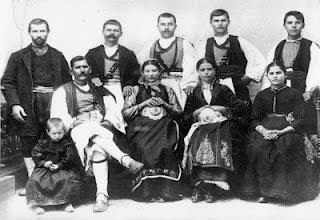 Mrs Louisa Gika, a weaver from Metsovo, interpreted all these many different names from the need for communication among the women, working the same loom. Professor Bousboukis was led to call it Caduceus by the morphology of the thematic core which is the bar with rhombus (diamond) instead of the original circle and the two inherent facing snakes. Another feature for its recognition are the wings of God Hermes (carrier of Caduceus). These are located in the formation, with the even bold, stylized wings that surround the central theme. Caduceus, as the legend of Metsovo (with ‘lailu Ali’= Black Ali, ruler of the underworld with 40 underground rooms filled with treasures) shows, was also known , at least, to the old wise people and very likely, to local scholars mythologists. In one tale, that A. Bousboukis read from Mr G. Plataris’ collection of tales (Metsovo), the slime of Merkoura (Merkour’lou in Aromanian is = Hermes) is described with two snakes facing each other. The rod symbolizes the tree of life, as a symbol of fertility is just another symbol of the great Sun of Sirius. Moreover, one can acknowledge the symbolism of fertility, which the rod encrypts (ciphers) in the morphology of the lower part of Caduceus of a tombstone, which belongs to Adea Cassandra 3rd AD century, which is located in the Museum of Veria. It is the small horizontal line, intersecting the rod just before that ends, and thus forming a clear hint for the morphological Phallus status of the symbol. We note the same morphological feature in the corresponding section of the rod at a Caduceus of Aromanian textiles from Veria, (original source: Avdela of Grevena). (Source: Wikipedia and ‘Ethnoglossological Analects, Thessaloniki 2005, Publications ‘Erodios’, by Antonis Bousboukis).